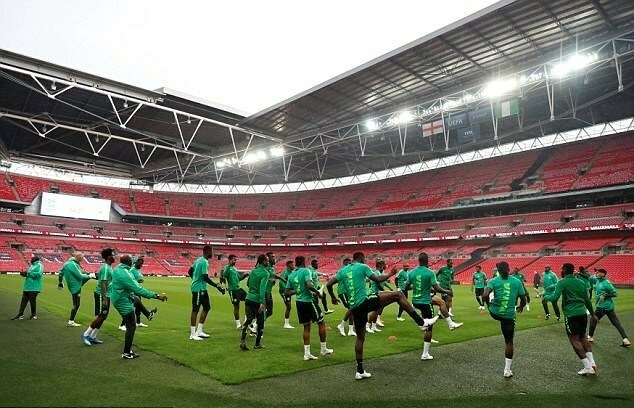 The Super Eagles of Nigeria squad have kicked off preparations for their friendly against England, which is part of the build-up games ahead of the 2018 World Cup in Russia this month. Captain John Obi Mikel alongside Victor Moses, Odion Ighalo, Alex Iwobi, Leon Balogun and Ahmed Musa among other stars who were pictured today training at the Wembley Stadium, where the game will kick off on Saturday, June 2, 2018. at 5:15 PM. Nigeria potential starting XI: Uzoho; Shehu, Troost-Ekong, Balogun, Echiejile; Mikel Obi, Etebo, Onazi; Victor Moses, Iwobi, Ighalo. England potential starting XI: Pickford; Walker, Stones, Maguire; Trippier, Dier, Henderson, Young; Alli, Sterling; Kane.